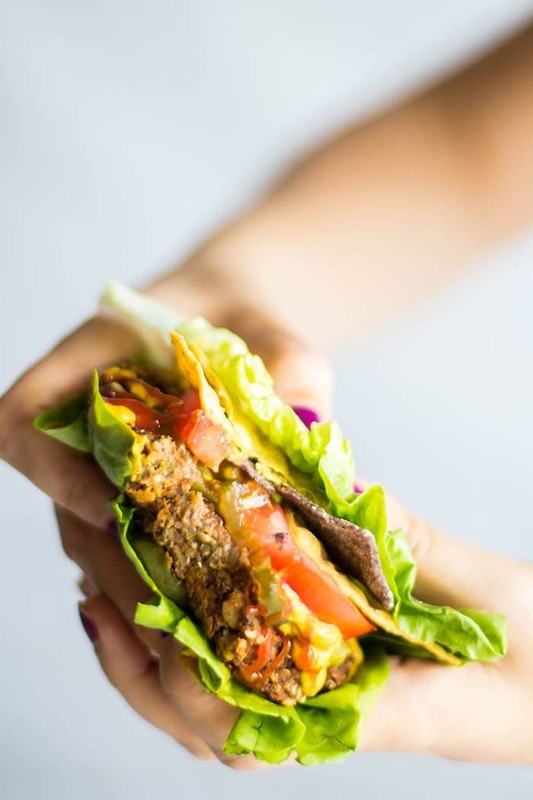 These vegan and gluten free Pumpkin Seed Veggie Burgers are packed with plant proteins and tons of flavor. I’ve given these a SW twist with lots of spices, and wrapped them in lettuce for a healthy meal option. I’ve been wanting to make veggie burgers for a long time. For some reason, they’ve seemed intimidating to me. How can you combine a bunch of veggies, grains and beans and have them all hold together? What is it about kitchen intimidation? I cook a lot, and have made a wide variety of meals, but I almost dread the first time I make something new. It takes longer. I am not sure if it’s going to work out, or if I am going to waste expensive ingredients. I put it on my list, look at it every week, and it can take months (or years) for me to finally take the plunge. The first time I made these was just a few weeks ago. I’ve been wanting to add more vegetarian meals to our meal rotation at home, and share more of those on my blog as well. I thought sure, I could make these vegan, but I bet an egg would keep these together and hold them much firmer. Wrong. Don’t use egg. It made them really gummy and difficult to form patties, and they were pretty crumbly. After they’d sat in the fridge for two days, they firmed up, but I knew I could do better. Without the egg, and with some flax meal, these turned out perfect. Another reason I had held off on making these was because I don’t like the idea of taking grains and beans, and putting it on a carb-laden bun. I am not afraid of carbs, but it just seems a little unbalanced to me. For an occassional treat, like at a summer BBQ? I absolutely would put one of these on a bun. But for more of an everyday lunch or dinner, I wanted to make it lighter. We love lettuce wraps, so I knew these would be great like that. I’ve been keeping it simple– just sliced tomato, pickles, and jalapenos, because the whole idea of having freezer ready meals is to NOT have to cook anything else, right? 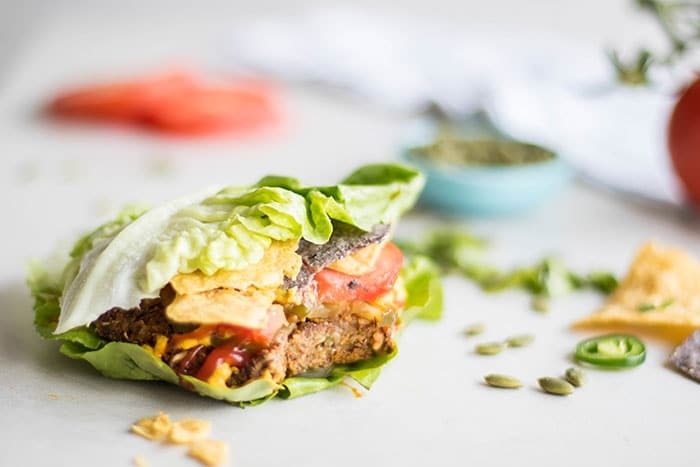 And to make these extra fun, we like to add tortilla chips to the lettuce wraps. A slice of cheese melted on them would also be great! And that leads me to my next announcement. I’ve been hearing both from readers and from friends who have toddlers they need ideas for healthy meals that are freezer friendly. With little ones at home, or when you have a busy work schedule, being able to double up when you cook, and freeze the leftovers is a huge sanity saver, and really helps make it easier to feed yourself and your family healthier meals. I have gone through my recipe archives, and also have been doing a little experimentation with some new ideas, for the best freezer friendly meals. These burgers not only passed the “taste-as-great-after-being-frozen-as-they-do-fresh-test”, I actually think I like them better! When these are freshly baked, they are pretty fragile. I leave them on the baking tray for 20-30 minutes before serving them so the patties firm up. When they are frozen, they reheat beautifully and you can actually enjoy them warm! I still let them rest about 5 minutes, but they are much firmer than when made fresh. Stay tuned for more freezer friendly meal ideas! If you aren’t on my mailing list, sign up to get notifications, and you’ll also get my free eBook, The Clean Eating Detox, a manual for those starting out on a clean eating journey with helpful tips and tricks for setting yourself up for success, plus a 3 day meal plan to help get you started. 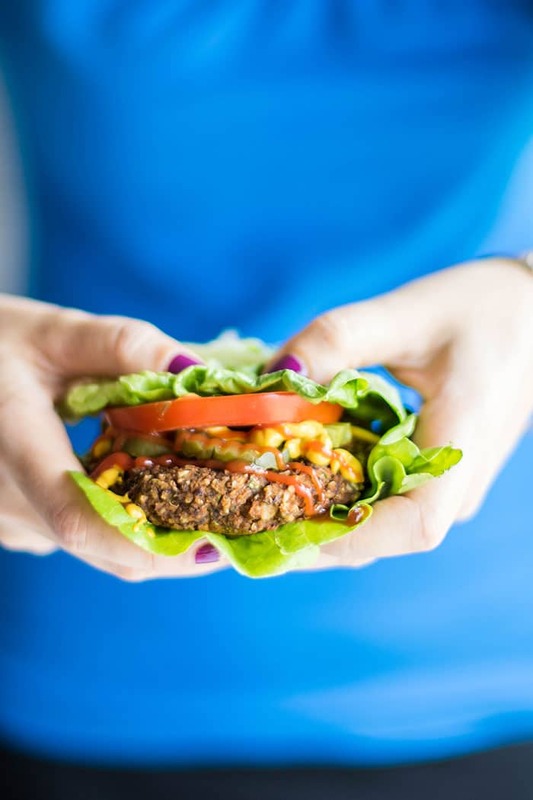 Make it Gluten Free: The ingredients in these burgers are all naturally gluten free! 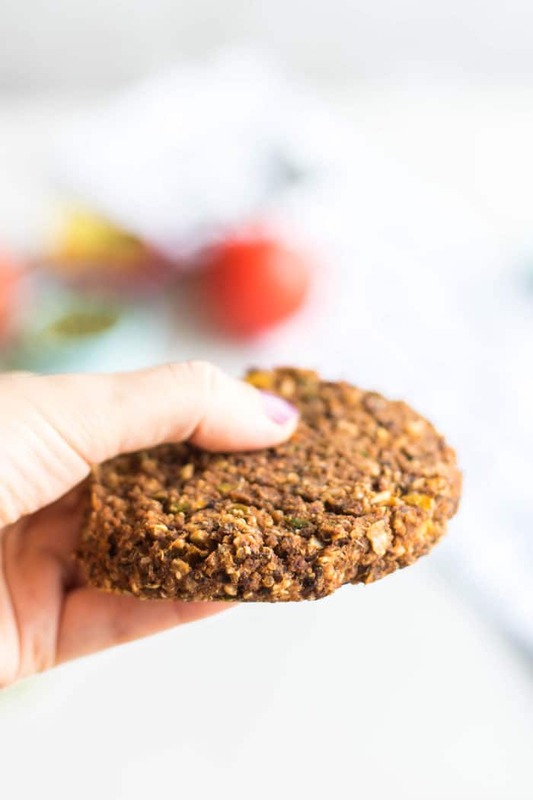 I use coconut aminos to amp up the flavor in these, but you could also substitute tamari and keep them gluten free (or just use a little extra sea salt). Make it Ahead: These are an amazing freezer meal! After baking these, layer them in tightly sealed containers or freezer bags with parchment between them. When ready to use, take them out of the freezer and allow to thaw for 10-15 minutes, and then reheat in the oven at 400 F for 15 minutes, or in a skillet over medium heat for about 10 minutes. I haven’t tried it yet, but these are so firm I am sure they would reheat great on the BBQ as well! For the Family: These are a perfect healthy (and quick!) meal for little eaters. Everyone in our house loves these. The chili powder I use is mild, so they are not spicy, but some chili powders can have a bit of kick to them, so add less if you are worried about them being too spicy. To make the process of making these easier, I roast the sweet potatoes and cook the quinoa ahead of time. If you're making quinoa for dinner, you can make extra to save for these. I roast 1 large or 2 smaller sweet potatoes on 425 F for 1 hour (you can also microwave them for an even easier prep). Add pumpkin seeds to a large frying pan over medium heat, stirring every few minutes, for about 10 minutes. While the pumpkin seeds are toasting, chop the onions and bell peppers. 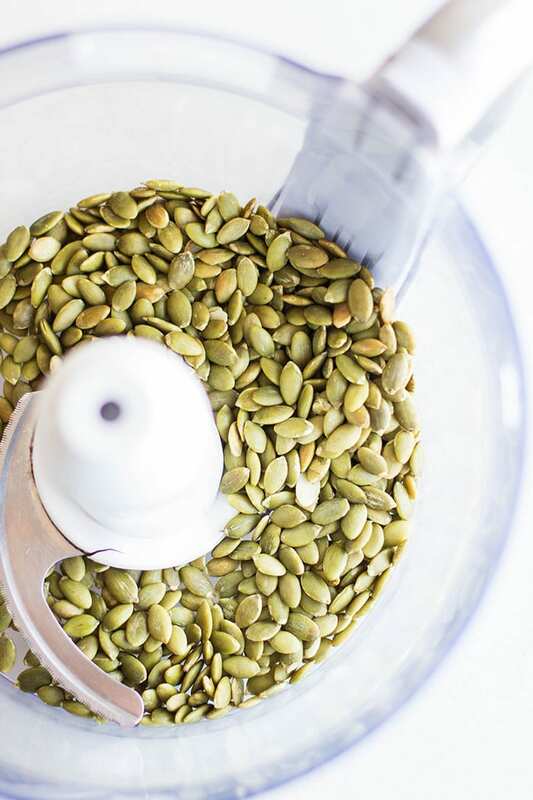 Add pumpkin seeds to the food processor bowl, and add olive oil, onions, and bell peppers to the frying pan. Saute for 7-10 minutes, until thoroughly softened. While the peppers and onions are sautéing, add all the spices, coconut aminos, and dijon mustard. Be conservative with the sea salt at first, and add more after the "dough" is made. Add the pepper and onion mix to the food processor bowl, and process for about a minute, until the seeds are broken up but still chunky. 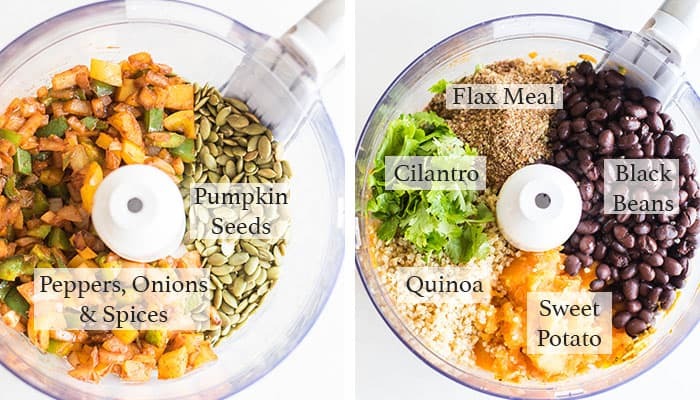 Add the quinoa, sweet potato, black beans, cilantro, and flax meal to the food processor, and continue to process for another minute, until all ingredients are mixed together but pieces of the ingredients are still visible. Shape "dough" into 1/2 cup patties. Wet hands help shape the sticky dough. If baking, add them to a lined sheet pan. If pan frying, add a bit of olive or grapeseed oil, and shape the patties and place in the pan. Bake on 425 F for 20 minutes (I don't flip these because they are fragile at first). Allow to cool for 15-30 minutes for them to firm up right after baking. If pan frying, add to pan over medium heat, and cook for about 10 minutes, very gently flip, and cook for another 10 minutes. These patties are fragile right after cooking fresh. They firm up a lot as they are cooling. They have more flavor and are firm after reheating if they've been frozen. To freeze, bake the patties, allow to fully cool, then place in a freezer container (or freezer bags) with pieces of parchment in between. To reheat, allow to thaw 10-15 minutes, then bake at 425 F for 10-15 minutes. They can also be reheated in a frying pan over medium heat. I usually freeze 6 of these as large patties (1/2 cup of dough), and make 6 small patties (1/4 cup), so I can reheat the small ones for my son's meals. Nutrition facts are for 1/9th of recipe. Yum! These are so creative and incredibly healthy. I must try these. 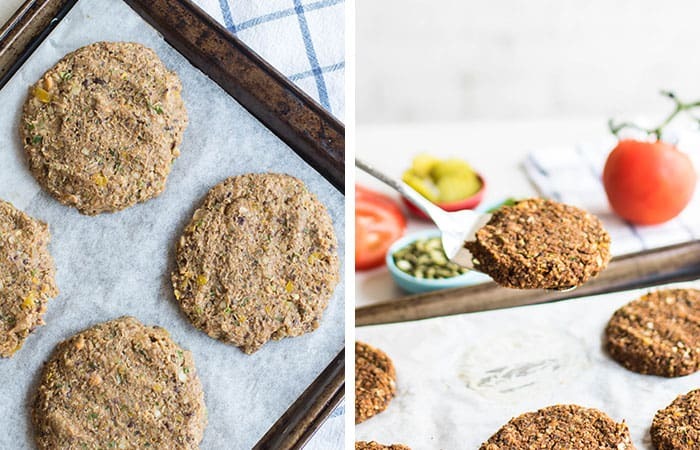 I love veggie burgers and thought I'd tried them all - but gee- wow - I've never had pumpkin seed ones! These sounds so so delicious! They are delicious! I love pumpkin seeds-- such a great source of protein. You are so smart to do this series! And it looks like you're off to a great start! Love the look of the texture of these burgers! Thanks Katie! It was a reader suggestion- she had seen something similar done on Pampered Chef, but wanted healthier choices. She asked me for suggestions and I thought it was a great idea. Yes, we have really been loving these. Convenient, and so delicious. My meat loving husband even asks for them now! Total thumbs up. And, Yum! I made these this morning and couldn't wait to taste. Love the flavors. So glad to find a veggie/ seed/ bean burger without oats as a base!! Hi Lizette! I am so glad you enjoyed these. We really love them, too! I am not a fan of the oat based ones either. I thought about using oats ground up, but there was no need! Thanks Ailsa! 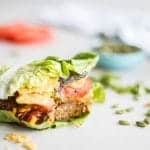 What a nice friend you are :) I also love to do healthy food for my friends who have just had a baby-- I know how much I needed it the first few months after having my son! 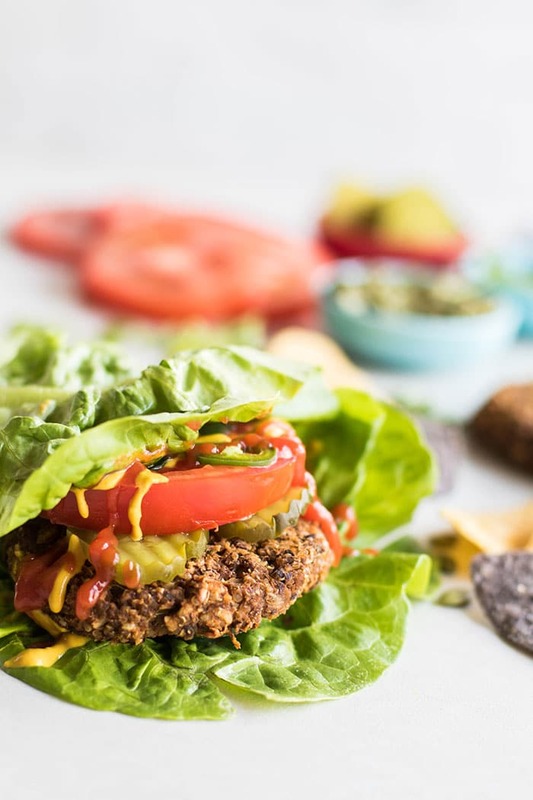 These veggie burgers have such great flavor-- they will love them!